In a big boy bed. My big girl bed when I was his age. And it melts my heart to see him in it. Don't forget to check out my sidebar for 3 amazing giveaways that all end tomorrow!! How cute! I love PB Kids! They have the cutest things! Thanks for stopping by and linking up. Have a great day! So sweet. I love those letters. Too cute. So sweet! I love his room. So cute! 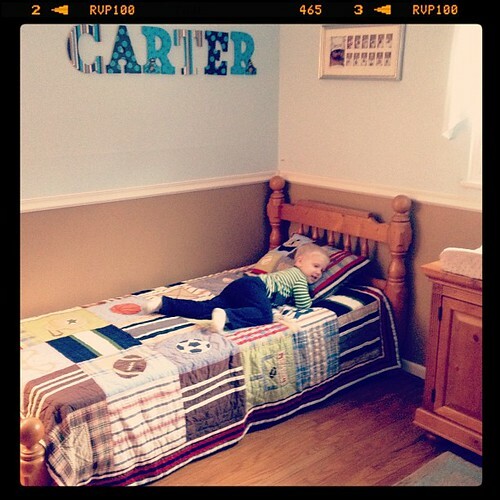 My lil' man will be in his own 'big boy' bed soon... makes me want to cry. Awesome! I wish The Dudes rooms were big enough for my old bed. It's a big iron deal that my parents still have. He looks like he's loving it! Growing up so fast. Love his room. My Carter (also almost 3 1/2) recently picked out some "digger" sheets at Target that SO don't match his blue/red plaid PBK quilt, but oh well, right?! Fun to have them have a say in their bedding choices (: Such big boys!